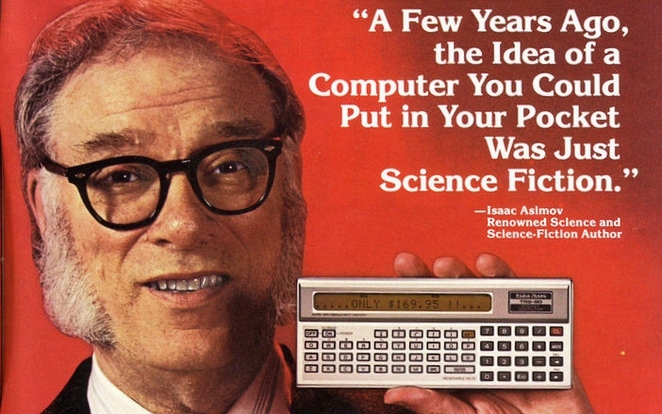 Of course we all walk around with powerful computers in our pockets now, and they do a lot more than Asimov’s Trash 80. There is a lot more stuff that was science fiction when Azimov wrote in the New York Times in 1964, after visiting the World’s Fair, and predicting life (and the contents of a world’s fair) in 2014. By 2014, electroluminescent panels will be in common use. Ceilings and walls will glow softly, and in a variety of colors that will change at the touch of a push button. Just a little bit ahead of his time here, as LED lighting becomes part of the fabric of our buildings and Sage type electrochromic glass becomes more affordable. Gadgetry will continue to relieve mankind of tedious jobs. Kitchen units will be devised that will prepare “automeals,” heating water and converting it to coffee; toasting bread; frying, poaching or scrambling eggs, grilling bacon, and so on. Breakfasts will be “ordered” the night before to be ready by a specified hour the next morning. Complete lunches and dinners, with the food semiprepared, will be stored in the freezer until ready for processing. I suspect, though, that even in 2014 it will still be advisable to have a small corner in the kitchen unit where the more individual meals can be prepared by hand, especially when company is coming. Here he missed the overwhelming rise of fast takeout food and frozen prepared food, but he gets that people might still want to cook occasionally. Robots will neither be common nor very good in 2014, but they will be in existence. The I.B.M. exhibit at the present fair has no robots but it is dedicated to computers, which are shown in all their amazing complexity, notably in the task of translating Russian into English. If machines are that smart today, what may not be in the works 50 years hence? It will be such computers, much miniaturized, that will serve as the “brains” of robots. Computers were not uncommon in 1964, but it is interesting that the only use he foresaw for them was the controlling of robots. Large solar-power stations will also be in operation in a number of desert and semi-desert areas — Arizona, the Negev, Kazakhstan. In the more crowded, but cloudy and smoggy areas, solar power will be less practical. An exhibit at the 2014 fair will show models of power stations in space, collecting sunlight by means of huge parabolic focusing devices and radiating the energy thus collected down to earth. The 2014 fair will feature an Algae Bar at which “mock-turkey” and “pseudosteak” will be served. It won’t be bad at all (if you can dig up those premium prices), but there will be considerable psychological resistance to such an innovation. Rethink Robotics/Promo image Will robots eat the entire middle class? The world of A.D. 2014 will have few routine jobs that cannot be done better by some machine than by any human being. Mankind will therefore have become largely a race of machine tenders….mankind will suffer badly from the disease of boredom, a disease spreading more widely each year and growing in intensity. This will have serious mental, emotional and sociological consequences, and I dare say that psychiatry will be far and away the most important medical specialty in 2014. The lucky few who can be involved in creative work of any sort will be the true elite of mankind, for they alone will do more than serve a machine. Had he written this fifteen years later, when he was the pitchman for Radio Shack’s TRS-80 line of computers, there probably would have been a very different vision. However it is fascinating reading; There’s lots more in the New York Times.